This is a very easy section and is a favorite tubing run. 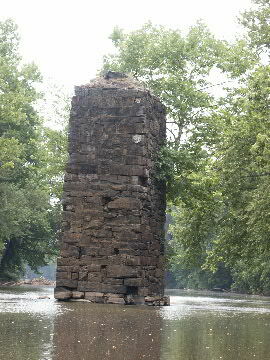 About ½ mile below the Leaksville Landing bridge is a large stone tower. It is from the Leaksville Toll bridge built in 1838. The batteau sluice is on river right. The Smith river enters from river left ¼ mile later. You will see Lynrock golf course on the left. The take out is on river right just past the overhead power lines.